If you pay someone to take care of your dependent (defined as being under the age of 13 at the end of the tax year or incapable of self-care) in order to work or look for work, you may qualify for a credit of up to $1,050 or 35 percent of $3,000 of eligible expenses in 2017. For two or more qualifying dependents, you can claim up to 35 percent of $6,000 (or $2,100) of eligible expenses. For higher income earners the credit percentage is reduced, but not below 20 percent, regardless of the amount of adjusted gross income. Example: You pay Bethany to babysit your child and do light housework four days a week in your home. Bethany follows your specific instructions about household and childcare duties. You provide the household equipment and supplies that Bethany needs to do her work. Bethany is your household employee. Tip: Two copies of Form I-9 are contained in the UCIS Employer Handbook. Visit the USCIS website or call 800-375-5283 to order the handbook, additional copies of the form, or to get more information, or give us a call. any employee under age 18 during 2017. Note: As of January 1, 2013, employers are responsible for withholding the 0.9% Additional Medicare Tax on an individual’s wages paid in excess of $200,000 in a calendar year. An employer is required to begin withholding Additional Medicare Tax in the pay period in which it pays wages in excess of $200,000 to an employee. There is no employer match for Additional Medicare Tax. Up to $255 a month in 2017 for transit passes that you give your employee or, in some cases, for cash reimbursement you make for the amount your employee pays to commute to your home by public transit. A transit pass includes any pass, token, fare card, voucher, or similar item entitling a person to ride on mass transit, such as a bus or train. A new federal law, aimed at making it easier for the IRS to detect and prevent refund fraud, will accelerate the W-2 filing deadline for employers to January 31. For similar reasons, the new law also requires the IRS to hold refunds involving two key refundable tax credits until at least February 15 (also new). Here are details on each of these key dates. The Protecting Americans from Tax Hikes (PATH) Act, enacted last December, includes a new requirement for employers. They are now required to file their copies of Form W-2 submitted to the Social Security Administration, by January 31, as well as Forms 1099-MISC. In the past, employers typically had until the end of February (if filing on paper) or the end of March (if filing electronically) to submit their copies of these forms. In addition, there are changes in requesting an extension to file the Form W-2. Only one 30-day extension to file Form W-2 is available, and this extension is not automatic. If an extension is necessary, a Form 8809 Application for Extension of Time to File Information Returns must be completed as soon as you know an extension is necessary, but by January 31. Please carefully review the instructions for Form 8809, and call the office if you need more information. The January 31 deadline has long applied to employers furnishing copies of these forms to their employees and that date remains unchanged. Due to the PATH Act change, some people will be getting their refunds later than they have in the past. The new law requires the IRS to hold the refund for any tax return claiming either the Earned Income Tax Credit (EITC) or Additional Child Tax Credit (ACTC) until February 15. Furthermore, by law, the IRS must hold the entire refund, not just the portion related to the EITC or ACTC. Even with this change, taxpayers should file their returns as they normally do. Whether they are claiming the EITC or ACTC or not, taxpayers should not count on getting a refund by a certain date, especially when making major purchases or paying other financial obligations. Typically, the IRS issues more than nine out ten refunds in less than 21 days; however, some returns may be held for further review. Please call if you have any questions about the earlier filing deadlines for Forms W-2 or 1099. For the past year, you’ve been faithfully creating new records, entering transactions, and recording payments. You’ve run basic reports. You’ve done your collection duties. You may have even paid employees and submitted payroll taxes. Now that another year has come and gone, if you haven’t done so, it’s time to wrap and review those work tasks that should have been completed by December 31. First up is your annual QuickBooks wrap-up. Figure 1: As your customers wrap up 2016, too, it’s good to send statements to past-due accounts. In an ideal world, all of the invoices that were due in December would be paid off by the end of the year. We all know that that’s not usually the reality. Two reports can help you here: the A/R Aging Summary and Open Invoices. If you didn’t give everyone a chance to clear their accounts before December 31 by sending statements, do so now. Click Statements on the Home page (or Customers | Create Statements) to open the window pictured above. You have multiple options here that are fairly self-explanatory. 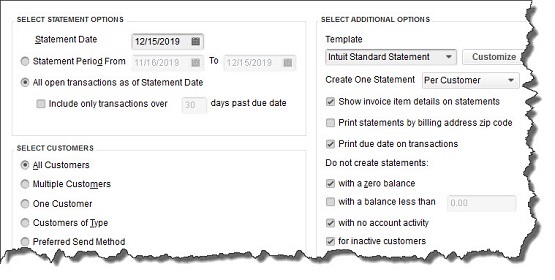 The screen above is set up to create statements for all customers who have an open balance as of the date you select, but not for inactive customers or those with a zero balance or no account activity. That way, no one who’s paid in full to date will receive a statement. Of course, if you didn’t want statements created for anyone who’s less than 30 days past due, you’d click in the box in front of Include only transactions over and enter a “30” in the following field. Tip: You can also find out who is overdue by clicking on the Customers tab in the left vertical pane to open the Customer Information screen. Click on the down arrow to the right of the field just below Customers & Jobs. QuickBooks provides several filters for your list. Figure 2: Want to discount all or selected items in your inventory by the same percentage or amount? Open the Customers menu and click Change Item Prices. If you only sell a few products, you probably already know what didn’t sell well in 2016. If your stable of products is larger, you can run QuickBooks reports like Inventory Stock Status by Item and Sales by Item Detail to identify your slow-sellers and discount them now. You may need to filter your reports to see the right data. Please call to discuss customization options if you’re unsure of how to do this. If you didn’t get around to doing this last month, then consider sending a greeting in January (Best Wishes for a Successful 2017!) when your customers’ and vendors’ lives have slowed down a bit. You’re less likely to get lost in the crowd. If your lists are short enough, personalize these cards as much as possible. At least sign them by hand if you can. Tip: You can print customer labels for your cards directly from QuickBooks. Open the Filemenu and then click Print Forms | Labels. Finally, if you’re not already using a QuickBooks professional to create and analyze advanced financial reports (found in the Accountant & Taxes submenu of Reports) monthly or quarterly, then you should be. They’re important, and they give you insight into your business financials that you can’t get on your own. Please call if you need assistance with this task. Thank you for being a client in 2016 and best wishes for a successful 2017! All employers – Give your employees their copies of Form W-2 for 2016 by January 31, 2017. If an employee agreed to receive Form W-2 electronically, post it on a website accessible to the employee and notify the employee of the posting by January 31. Employees – who work for tips. If you received $20 or more in tips during December 2016, report them to your employer. You can use Form 4070, Employee’s Report of Tips to Employer. Individuals – Make a payment of your estimated tax for 2016 if you did not pay your income tax for the year through withholding (or did not pay in enough tax that way). Use Form 1040-ES. This is the final installment date for 2016 estimated tax. However, you do not have to make this payment if you file your 2016 return (Form 1040) and pay any tax due by January 31, 2017. Farmers and Fisherman – Pay your estimated tax for 2016 using Form 1040-ES. You have until April 18 to file your 2016 income tax return (Form 1040). If you do not pay your estimated tax by January 17, you must file your 2016 return and pay any tax due by March 1, 2017, to avoid an estimated tax penalty. Employers – Federal unemployment tax. File Form 940 for 2016. If your undeposited tax is $500 or less, you can either pay it with your return or deposit it. If it is more than $500, you must deposit it. However, if you already deposited the tax for the year in full and on time, you have until February 10 to file the return. Farm Employers – File Form 943 to report social security and Medicare taxes and withheld income tax for 2016. Deposit or pay any undeposited tax under the accuracy of deposit rules. If your tax liability is less than $2,500, you can pay it in full with a timely filed return. If you deposited the tax for the year in full and on time, you have until February 10 to file the return. Certain Small Employers – File Form 944 to report Social Security and Medicare taxes and withheld income tax for 2016. Deposit or pay any undeposited tax under the accuracy of deposit rules. If your tax liability is $2,500 or more from 2016 but less than $2,500 for the fourth quarter, deposit any undeposited tax or pay it in full with a timely filed return. If you deposited the tax for the year timely, properly, and in full, you have until February 10 to file the return. Employers – Social Security, Medicare, and withheld income tax. File Form 941 for the fourth quarter of 2016. Deposit any undeposited tax. If your tax liability is less than $2,500, you can pay it in full with a timely filed return. If you deposited the tax for the quarter in full and on time, you have until February 10 to file the return. Employers – Nonpayroll taxes. File Form 945 to report income tax withheld for 2016 on all nonpayroll items, including backup withholding and withholding on pensions, annuities, IRAs, gambling winnings, and payments of Indian gaming profits to tribal members. Deposit any undeposited tax. If your tax liability is less than $2,500, you can pay it in full with a timely filed return. If you deposited the tax for the year in full and on time, you have until February 10 to file the return. Employers – Give your employees their copies of Form W-2 for 2016 by January 31, 2017. If an employee agreed to receive Form W-2 electronically, post it on a website accessible to the employee and notify the employee by January 31, 2017. Individuals – who must make estimated tax payments. If you did not pay your last installment of estimated tax by January 17, you may choose (but are not required) to file your income tax return (Form 1040) for 2016 by January 31. Filing your return and paying any tax due by January 31, 2017, prevents any penalty for late payment of the last installment. If you cannot file and pay your tax by January 31, file and pay your tax by April 18, 2017.